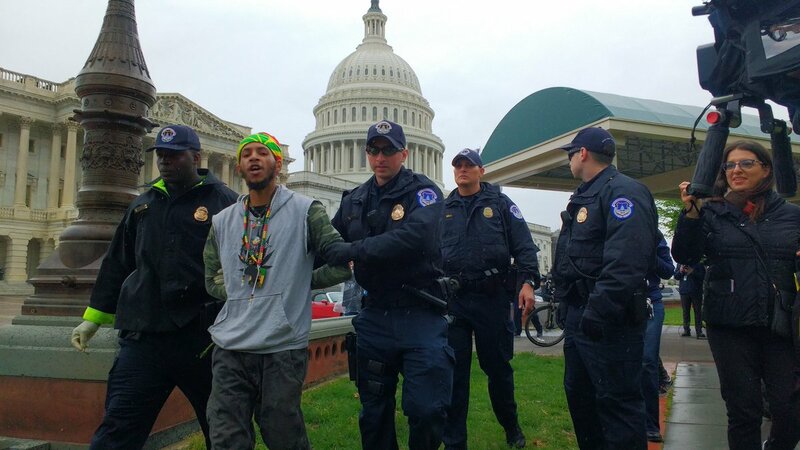 Days after eight legalization advocates were arrested during a 4/20 cannabis giveaway in Washington, DC, activists returned to the Capitol today for round two of protests—and were met with even more arrests. At least four individuals were arrested Monday at a “smoke-in” outside the Capitol, US News reporter Steven Nelson posted to Twitter. The action was intended as an act of civil disobedience, both in response to the 4/20 arrests and in support of nationwide legalization. Nikolas Schiller, a co-founder of the group D.C. Marijuana Justice, says two men and two women were arrested by US Capitol Police shortly after they started smoking on Monday afternoon. Originally, activists planned to gather outside the Capitol at noon local time, then light up at 4:20 p.m. Below is the scene just before the four arrests were made. Capitol police spokeswoman Eva Malecki says the four were charged with possession, a violation of federal law. DCMJ, the organization behind both the 4/20 joint giveaway and Monday’s “smoke-in,” has been a persistent pebble in federal officials’ proverbial boot. Members have lit up joints on the National Mall during President Trump’s inauguration, interrupted Jeff Sessions’ Senate confirmation hearing, and paraded a 51-foot joint outside the Democratic National Convention. The tactics have earned the group a reputation for disruption. When 17 DCMJ volunteers arrived at Sessions’ Capitol Hill office in November, after Trump nominated him for attorney general, staffers expected the group to light up joints in the building. “They were aware that we were coming,” lead organizer Adam Eidinger told Leafly at the time, “but they thought we were coming to smoke marijuana in their office. Eidinger is one of two activists facing criminal charges after his arrest during the 4/20 cannabis giveaway. Eidinger, the event’s chief organizer, allegedly possessed 2.06 oz. of cannabis, according to charging documents. Another defendant, William Angolia, allegedly had 2.405 oz. The misdemeanor charges carry a maximum penalty of six months in jail and a $1,000 fine. Public consumption of cannabis remains illegal in the District.